Outline open office spatial layout strategies that can mitigate workplace noise, thereby improving occupant productivity and well-being. Describe “passive” technologies, including surface treatments and construction details, for sound blocking and absorption. Explain the principles behind “active” acoustic technologies, such as sound masking. Explain the fundamentals of sound and define acoustical technical terms relevant to open office design. 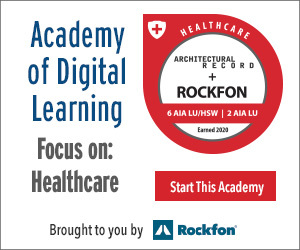 Discuss methods for evaluating the level of speech privacy, noise reduction, and overall acoustic quality a particular design or spatial configuration will provide. 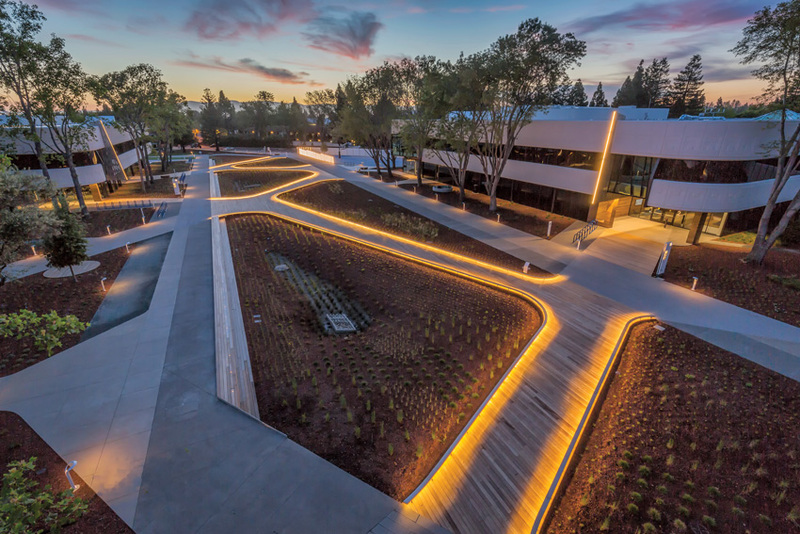 SERA’s revamp of a complex for LInkedIn in Mountain View, California, replaced a parking lot with a landscaped courtyard (top), removing car noise from the campus center. The buildings’ interiors are zoned so that areas where people would naturally gather, such as kitchens (above), are positioned adjacent to skylit atria. 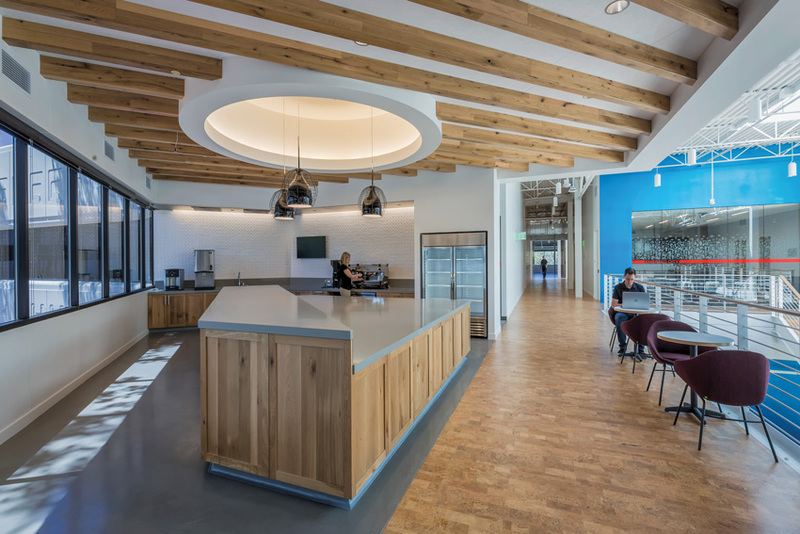 SERA’s approach to acoustics on all of its projects, LinkedIn included, is based on recommendations in the General Services Adminis­tration’s publication Sound Matters. In addition to defining essential terms, providing an overview of the relevant research, summarizing key concepts, and detailing specific strategies, the publication (intended to assist owners and employers, architects, user groups, and other members of the design team) provides a 10-step checklist for achieving acoustic comfort in offices. The first four steps, pre-design, consist of developing the acoustic program and defining workplace policies. The next three address the design of the spatial layout, while the final steps deal with the acoustical treatment of spaces. Acoustics rank as a high priority for any company wanting to foster productivity and well-being in the workplace, but for Plantronics, an audio-communications-­equipment company, acoustics are a matter of identity. So its first ground-up, new office facility, the company’s Europe, Middle East, and Asia headquarters, completed last year in Hoopdorf, the Netherlands, puts acoustics first and foremost. The 40,000-square-foot, three-story building’s clean, monochromatic exterior is intended to reflect the company’s mission and design philosophy, according to the architect, William McDonough+Partners. The spacing of reflective metal panels and windows, shifting between solid and transparent areas, is inspired by sound wave patterns. The interior, designed by a team from Gensler’s New York and San Francisco offices in collaboration with local N30 Architects, engages visitors and employees in an acoustic-integrated narrative. Beginning with the parking garage—where most people will arrive—graphics provide an overview of the company’s history. The elevator and stairwell provide an acoustic pause, with sound-absorbing panels creating a sense of calm, and light and white surfaces supporting the silence. From the ground-floor lobby—which provides a fuller introduction—stairs ascend within two diagonally stacked double-height atria. To prevent the free roaming of sound from floor to floor, a large wall rising through the space is faceted and fissured with acoustic plaster to absorb and break up reflections. “You can dampen, you can block, you can cover,” says Milena Jovovic, design director at Gensler, “but this breaks up the sound waves so they would naturally dissolve.” A living wall, intended primarily for biophilic effect, also helps dissolve sound waves. The narrative continues in an exhibition area on the second floor, where a special room designed to approximate an anechoic chamber (one that absorbs reflections of sound or electromagnetic waves) creates nearly complete silence. Here, an interactive tabletop with a complementary lighting installation allows visitors to experience the acoustics of a typical workspace and then transform them with soundscaping. This technology is a refinement of sound masking, an active strategy among the primarily passive tactics of acoustic design. Masking delivers low-level background sound matched to the spectrum of human speech—mitigating what might otherwise be uncomfortable silence and rendering normal conversation unintelligible to the casual listener. Soundscaping achieves the same effect using identifiable sounds, such as flowing water, which Plantronics has found to be most effective at mitigating speech distraction. The sound of water also has the benefit of mood-enhancing associations. Sound­scaping can also be dynamic, residing in the Cloud and using sensors in an Internet-of-Things (IoT) infrastructure to respond to the volume of noise in different parts of the office in real time. The Gensler-designed interiors for the offices of audio-equipment company Plantronics in Hoopdorf, the Netherlands, include a double-height lobby (left) with a faceted wall that mitigates acoustic reflections. Upstairs, water features (right bottom) provide low-level background noise. A nearly anechoic room (right top) allows visitors to experience soundscaping. That one thing is affected by a multitude of factors, and Plantronics, LinkedIn, and Microsoft each emphasize different strategies, or give different expression to similar strategies, in their approach to workplace acoustics. In a comment that pertains equally to all three projects, however, SERA’s Colby identifies what underlies their acoustic excellence. “It isn’t that they faced some heroic challenge, like creating the world’s greatest concert hall,” he says. “It’s that they required a lot of discipline, consistency, and follow-through to apply a wide range of acoustic-design principles across a variety of spaces—with the typical budget pressures that even well-funded projects face.” That lesson is not just for the tech sector; it has the potential to help people in open offices everywhere to concentrate more easily, and to enjoy better acoustics during their time at work.